1978: Initiation to Philosophy and Theravada Buddhism during a journey through Asia. Stay in a Buddhist monastery (Kanduboda) in Sri Lanka. Meeting with K Seevali Thera (meditation monk instructor). 1986: Beginnings in Nice, Aikido, Iaido and Jodo. Meeting with my first teachers in Budo, Dominique Boetti and Daniel Leclerc. 1991: Meeting with Quintin Chambers in Penang, Malaysia. 1st dan Jodo SMR. 1994: Meeting with Tsuneo Nishioka in Hawaii. 1999: 3rd dan Jodo SMR in Lillsved, Sweden. 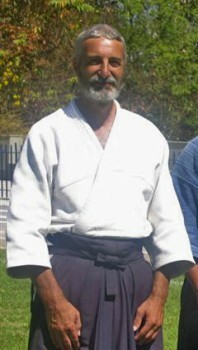 2002: Oku-Iri SMR Jodo in Sevenum, Holland. 2011: Received the Shomokuroku certificate during the Kagami Biraki. 2016: Received the Gomokuroku certificate during the summer camp.